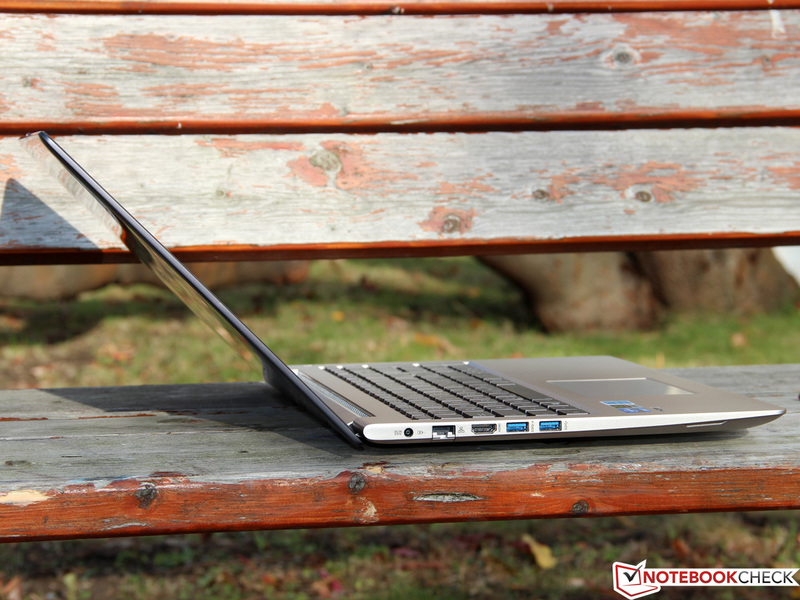 In a way, any decision to purchase a notebook is a search for a compromise: weight and size, mobility, size of the display, performance - all those characteristics that make up the ideal notebook are often opposing in their nature and can't be easily combined into one unit. If there is one manufacturer who has repeatedly succeeded with the seemingly impossible task to create such notebooks, it's Apple. The undoubtedly very expensive, but from a technical standpoint very convincing MacBook Pro 15 Retina recently raised the bar for the competition to new levels. 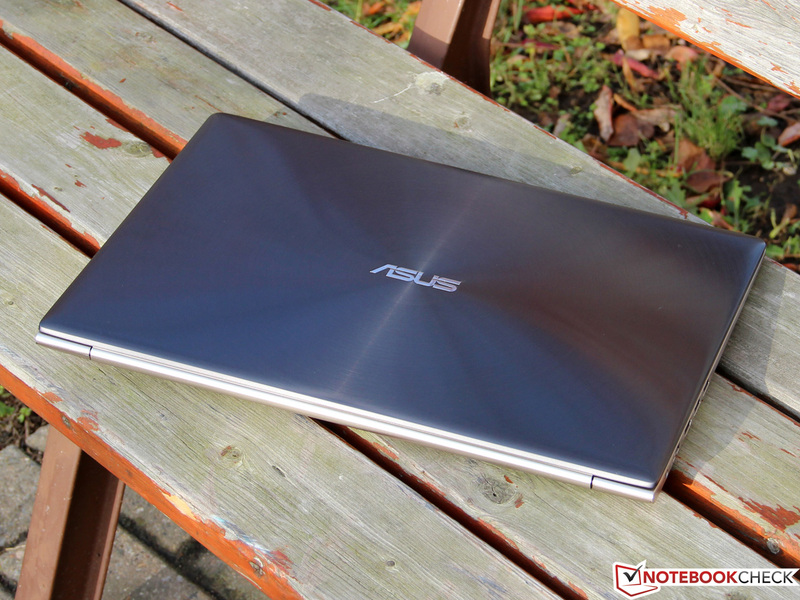 Enter Asus and their new Zenbook, which seeks to challenge the dominating notebooks from Cupertino. The Zenbook UX51VZ - a combination of an Ultrabook and a powerful multimedia notebook - attempts to merge the attributes of each category together into one seamless unit. A quick look at the specs reveals some high-end components: quad core i7-3612QM CPU, GeForce GT 650M GPU, FullHD display with IPS panel, and SSD RAID. Mouthwatering specs - so what's not to like? The price, for one: Asus charges 1700 Euros (~$2170) for the 256 GB and 2000 Euros (~$2550) for the 512 GB version - almost in Apple territory. The conceptually similar models of the competition - the Dell XPS 15 and Sony Vaio SV-S1511 - are not really any cheaper though when configured similarly. The UX51VZ can't be officially called an Ultrabook - but not because it doesn't meet the specifications as far as the size is concerned. Intel specifies a maximum thickness of 21 millimeters (0.83 inches) - and the Zenbook is only 6 to 20 millimeters (0.24 to 0.87 inches) thick. Visually, the wedge-based design (which reminds us of the UX31A) looks even more delicate than the current MacBook Pro 15 (the Retina model shaves off a few millimeters more). The weight is also quite evenly matched: Apple's notebook comes in at a little above 2 kilograms (4.40 pounds), the UX51VZ weighs exactly 2.2 kilograms (4.85 pounds). Even though the difference might be measurable, it won't be noticeable on a daily basis. As expected in this lofty price range, Asus uses a premium metal alloy chassis - in this case, it's not a unibody design, but rather two halves screwed together. 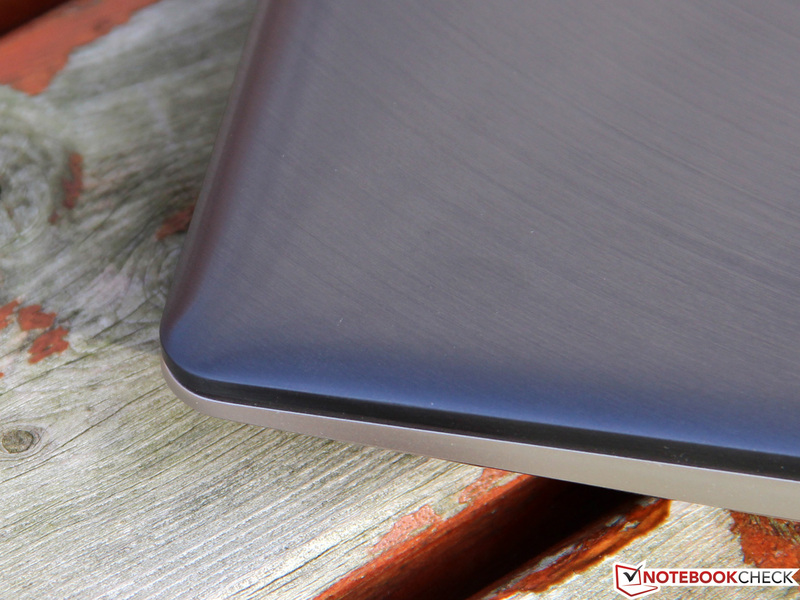 The medium-glossy, brushed aluminum surfaces certainly emphasize the premium status of this notebook. Although the design is understated, Asus uses visual accents to freshen up the look: the slightly darker display bezel contrasts nicely with the silver base, which in turn is accentuated up by an LED power button. 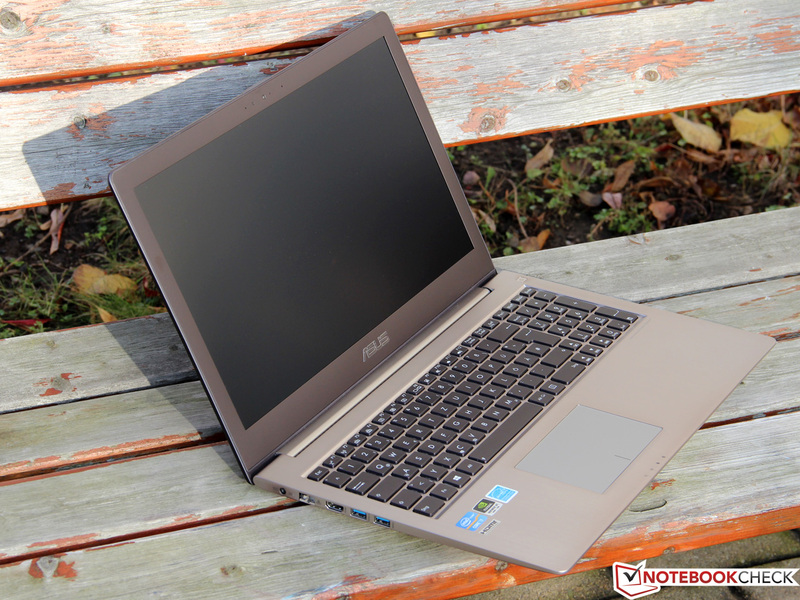 Very slim designs could possibly lead to issues with the overall stability - but the Zenbook manages to put those concerns to rest immediately: in addition to being torsionally very rigid, the chassis resists pressure extremely well. 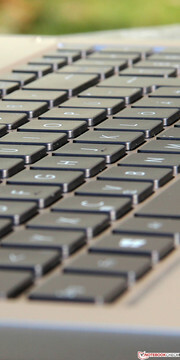 Only the area above the keyboard exhibits some flex when very high forces are applied. As far as workmanship is concerned, there are absolutely no issues: all edges are smooth and the transitions nearly seamless. Just like Apple, Asus uses a single hinge in the middle to anchor the display to the base unit. 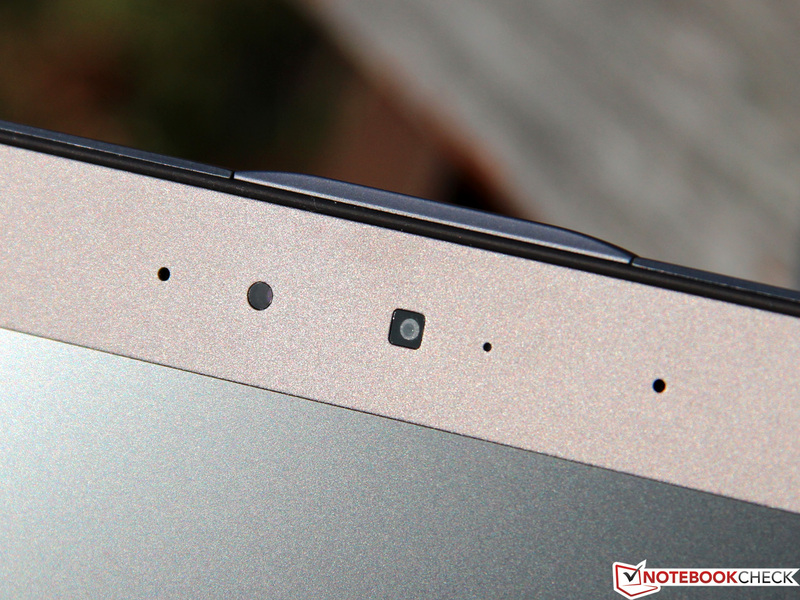 The hinge is quite stiff and successfully prevents annoying display wobbles. Stiffness notwithstanding: the lid can be opened with one hand - the base unit never loses contact with the surface it is sitting on. Overall, the chassis quality ranks just a smidgen below the almost perfect design of the MacBooks or the Dell XPS 15. Fortunately, Asus doesn't follow the Ultrabook "standard" as far as the (usually fairly limited) port selection is concerned. 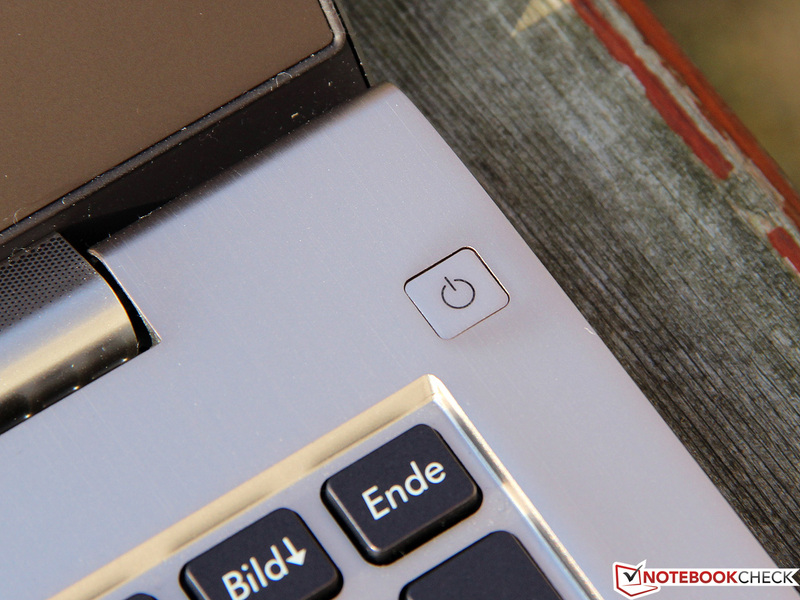 In fact, the UX51VZ comes rather well equipped: there are three USB ports - all of them support the newer USB 3.0 standard (one of them also supports "Sleep-and-charge" to allow charging of USB devices even when the notebook is turned off). To hook up external monitors, the user can choose between HDMI and Mini-VGA (the dongle adapter to VGA ships with the notebook). Unfortunately, neither a DisplayPort nor a Thunderbolt port are included - the latter would be needed for extremely high resolution displays. HDMI theoretically allows resolutions way above FullHD, but unfortunately driver issues usually prevent reaching the theoretical limit. 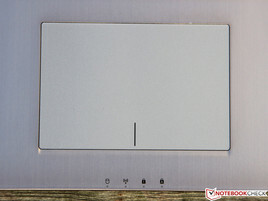 In addition, the notebook features all the standard ports and connections one would expect: Gigabit LAN, card reader (SD/SDHC/SDXC/MMC), headphone jack. The ports are located on the left and right sides and have ample space between them. 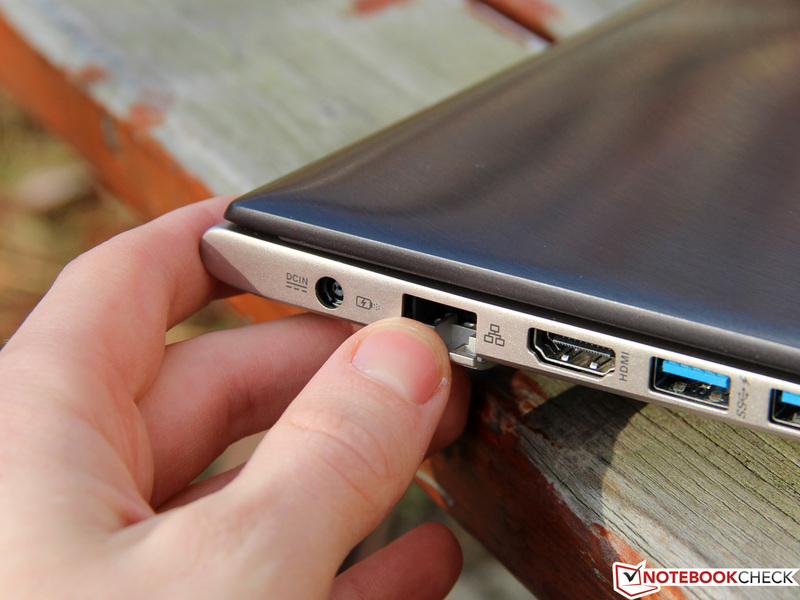 Frequently used ports - like USB - are housed more towards the front of the notebook; the less important ones have been moved to the back. 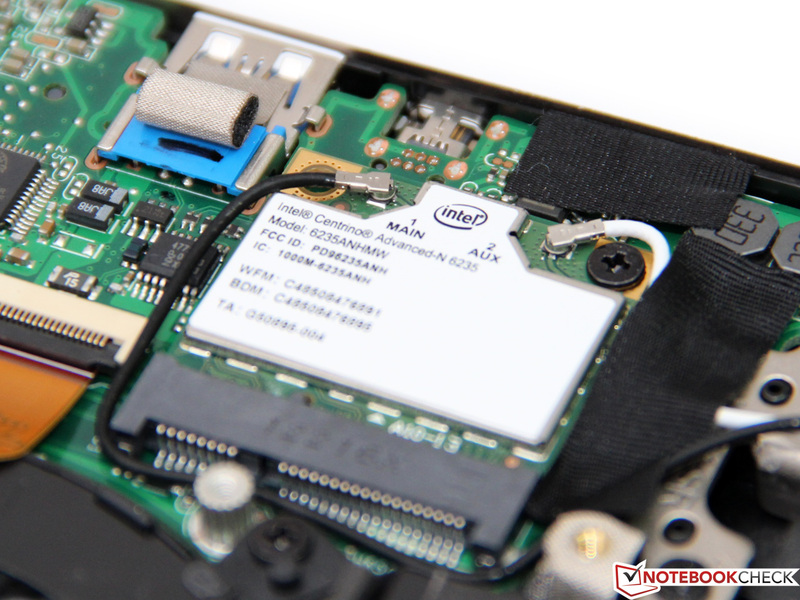 The networking components are a carry-over from the smaller UX31A The Mini PCIe module Centrino Advanced-N 6235 from Intel supports both Bluetooth 4.0 and the WLAN standards 802.11a/b/g/n. Since this is a dual-band adapter, the user can choose either 2.4 GHz or 5 GHz; the maximum data transfer rate is 300 MBit/s (2x2 Multi Stream). Intel WiDi (Wireless Display) allows the user to share laptop content wirelessly on an external device (TV). The only thing missing is integrated WWAN (UMTS/LTE). 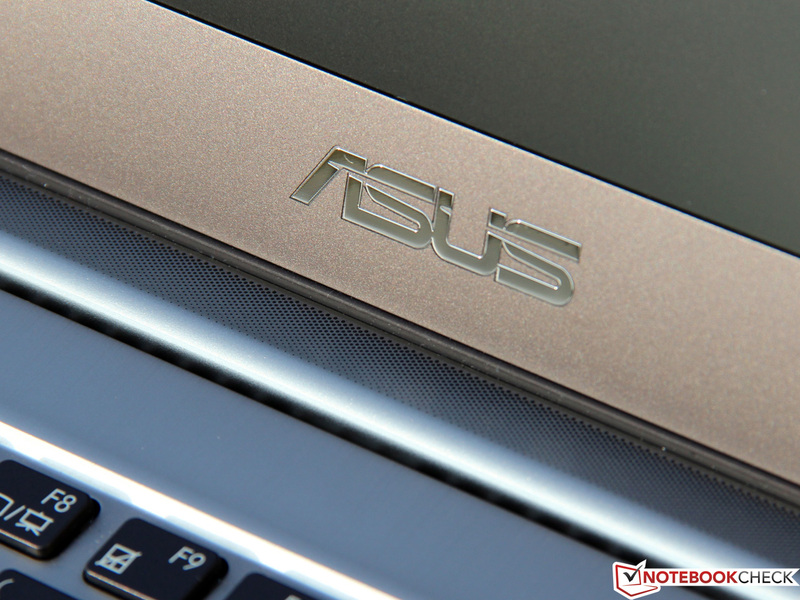 Asus equips this Zenbook with a 1.0 megapixel webcam with microphone - just like the other models in the series. The cam functions well for video chats, but the picture and sound quality is just average - probably better to rely on one's smartphone to snap photos. Users of MacBooks know that even very basic accessories aren't included in the purchase price and need to be bought separately - sometimes for very inflated prices. 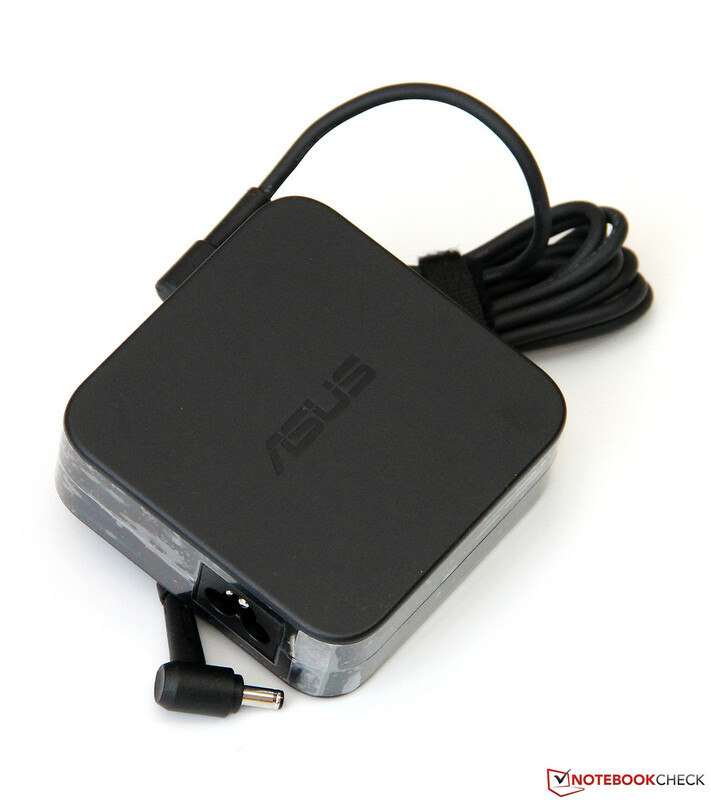 Asus includes quite a few extras: the aforementioned VGA dongle, an external DVD RW optical drive, and a small subwoofer (see Asus N56VZ). In addition, the carton contains a very compact power adapter (90 watts), different pamphlets, and a few extras (a CD with drivers, a cleaning cloth, and a cable tie). Even though it doesn't take a tremendous amount of skill to open the notebook, we wouldn't recommend it to non-professional users. The first hurdle: Asus uses Torx screws, which require a special T5 screwdriver. Two of the twelve screws are hidden under rubber feet, which need to be removed first. Taking off the bottom is also a bit challenging since Asus uses a layer of tape to hold it attached. 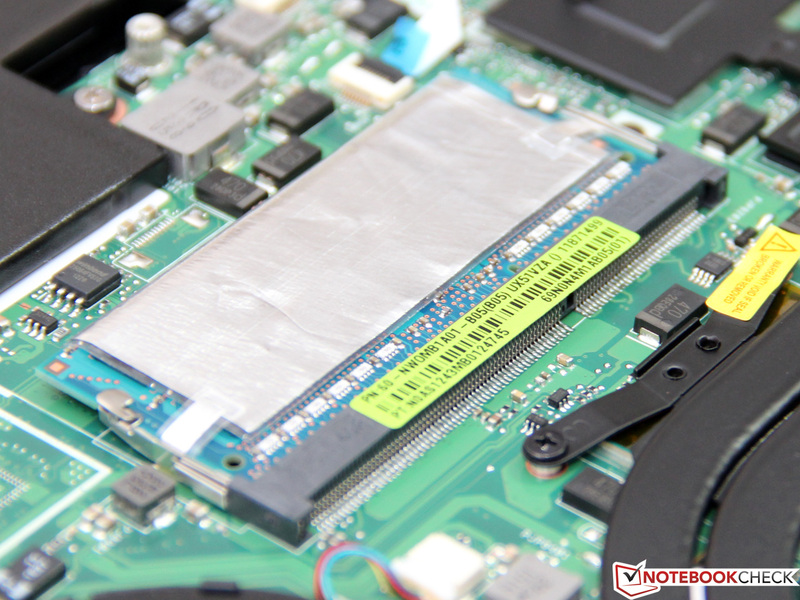 The inside of the notebook looks to be well organized, but unfortunately there are not many options to upgrade: one of the RAM modules can be changed out, 4 GB RAM is soldered onto the motherboard. 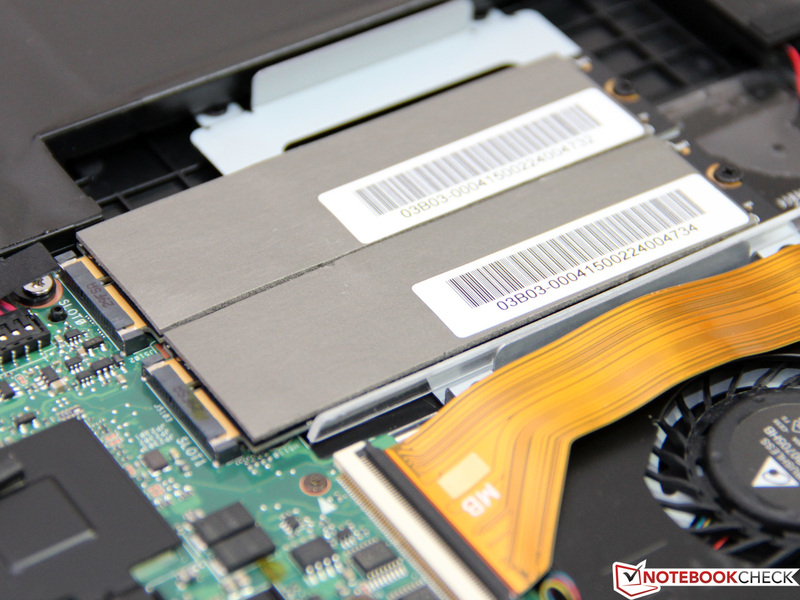 The SSDs feature a proprietary connector and can't be swapped out for a 2.5-inch or mSATA drive. At least the two fans can be cleaned and the WLAN module is easy to replace. 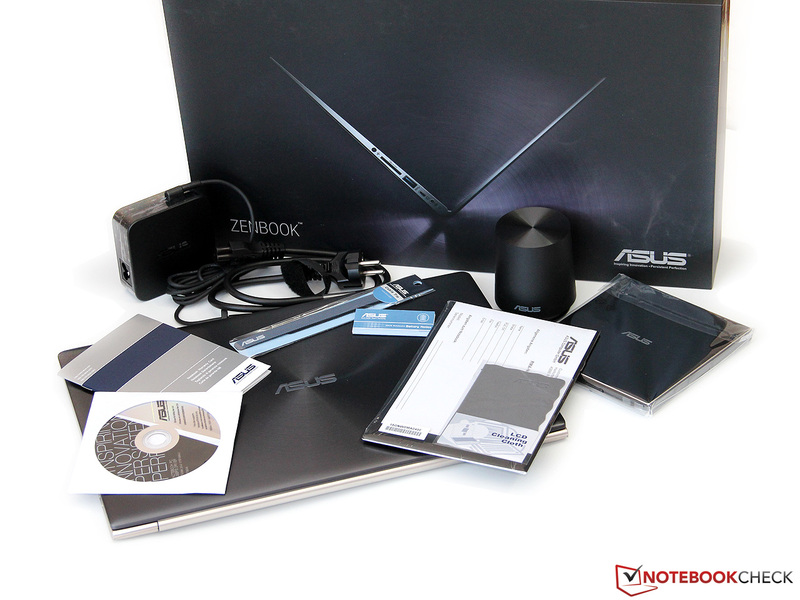 The notebook is covered by a 24 month warranty with pickup and return service. Of course there are plenty of options to upgrade and extend the coverage: 3 years can be had for around 75 Euros (~$95, depending on where purchased). Considering this notebook retails for around 2000 Euros (~$2550), we think this is a very reasonable amount and a worthwhile investment. 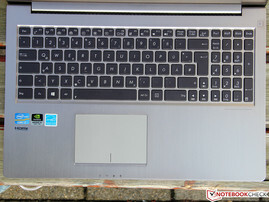 Unlike Apple or Dell, Asus uses the whole width of the 15-inch chassis to integrate a keyboard with separate numeric keypad. The chiclet-style design features keys which are about 15 x 15 millimeters (0.59 x 0.59 inches) in size and still sufficiently large for those with bigger hands. The quality of the plastic as well as fit and finish are top-notch and among the best we've found. We appreciate the fact that Asus didn't experiment with the layout much - even desktop users should have no issue getting used to this keyboard. The positive first impression doesn't change: we particularly like the medium-firm pressure required to actuate the keys. 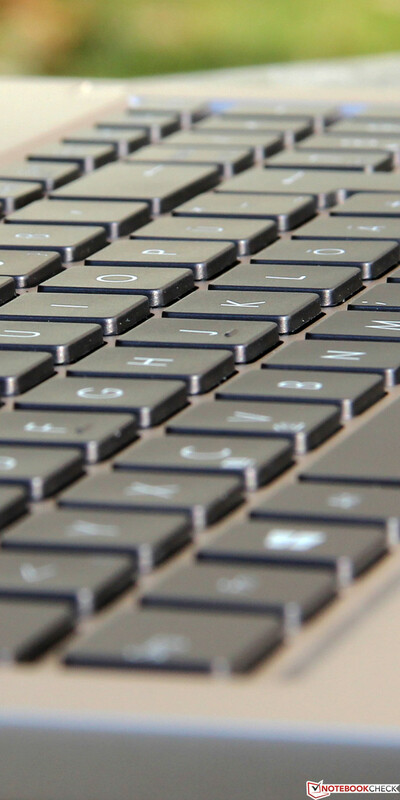 Similar to Apple's MacBook series, the keys don't have a textured surface or any kind of indentation - however, typing accuracy is not affected. Even while touch typing at high speeds, the keyboard remains quiet and no flexing could be observed - which makes this keyboard suitable for those who need to type a lot. If the ambient light is not enough, the keyboard backlighting can be activated (three levels). 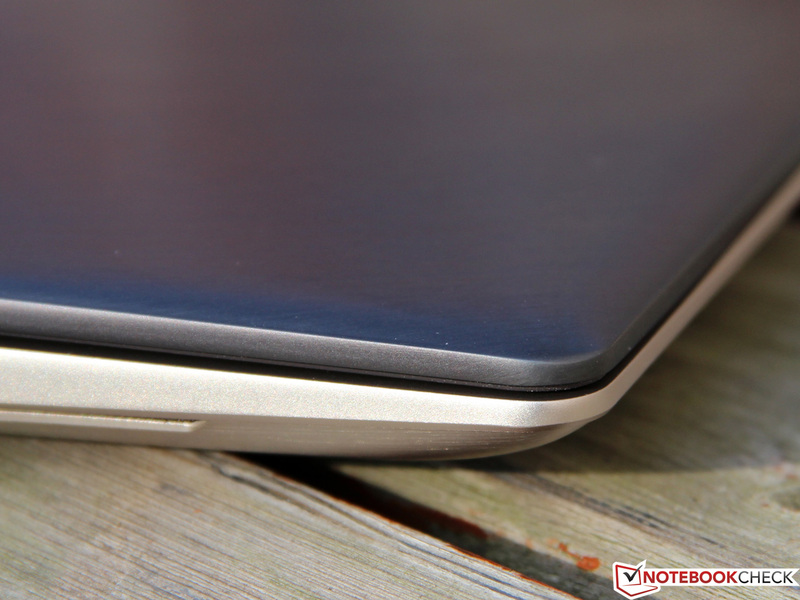 The touchpad, which measures 10.5 x 7 centimeters (4.13 x 2.76 inches), is also found on the other Zenbook models. Fingers glide extremely well over the smooth, satiny surface and precise control of the cursor is a breeze. The touchpad supports multi-touch gestures like zooming and scrolling (pretty much a standard feature nowadays); we do like how well the pad responds. 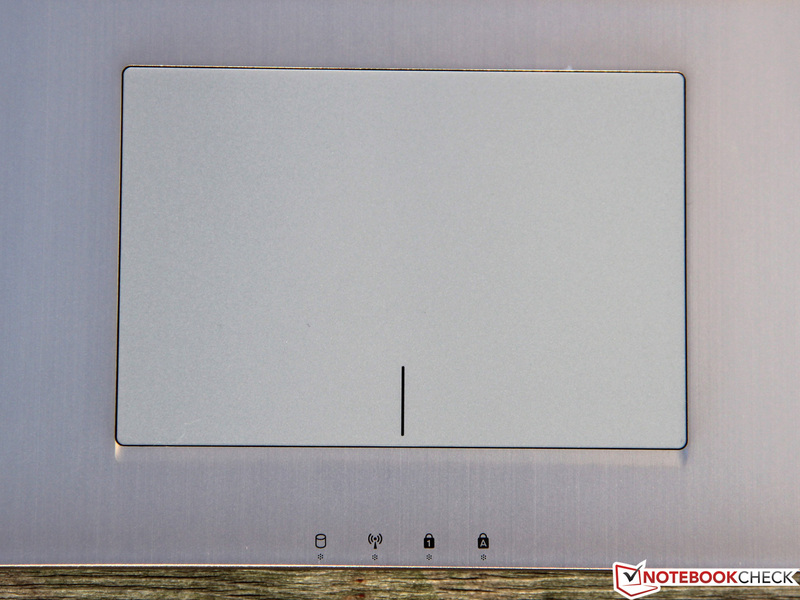 Since this is a clickpad, the mouse buttons are integrated into the lower part of the touchpad surface. While this might not be something everyone appreciates, since it is possible to move the cursor from the intended position while clicking, we do appreciate the high quality of the implementation: the feedback of the buttons is excellent, the travel pretty short, and the clicking sound unobtrusive. 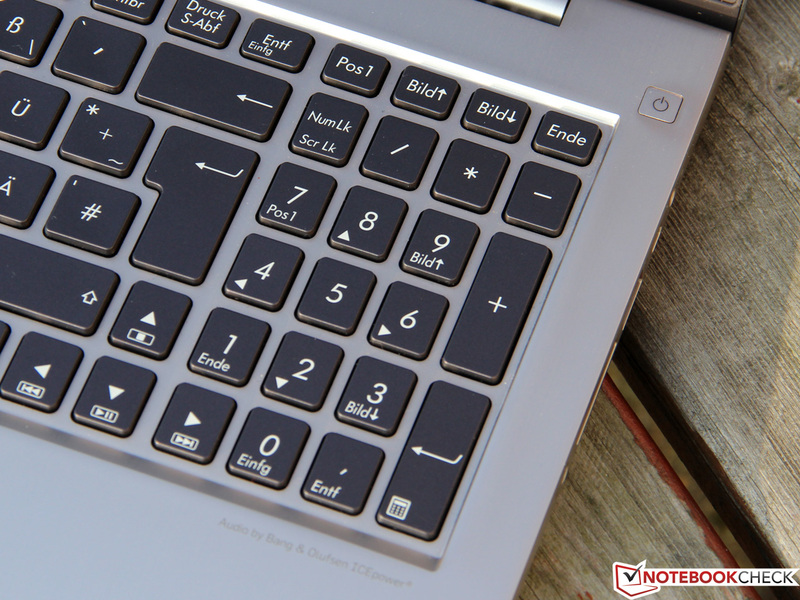 Compared to the 13.3-inch UX31A, the UX51VZ features a larger 15.6-inch panel. The resolution, however, remains the same - 1920x1080 pixels (FullHD). The resulting pixel density drops to 141 dpi, which still allows for clear and sharp images, but is a far cry lower than the MacBook Pro 15 with Retina (2880x1800 pixels), which offers 221 dpi. Of course, the difference is not really of consequence, unless the viewing distance is unrealistically close. The Retina display features a "standard" resolution of 1440x900 pixels - meaning that the screen real estate of the UX51 is actually larger. The display features an ambient light sensor, which can be deactivated if so desired. We measured an average brightness of 265.3 cd/m² - not outstanding, but similar to the Apple notebook (273 cd/m²). The decrease in brightness in the lower bottom corners is not really noticeable during use; however, some bleeding around the perimeter is. At this point we do not know if this issue affects the whole series or just our review unit. Asus uses a premium IPS panel from LG (LP156WF4), which offers significant advantages when compared to regular TN panels. The black point is a pretty decent 0.58 cd/m² and results in a very acceptable contrast ratio of 498:1. 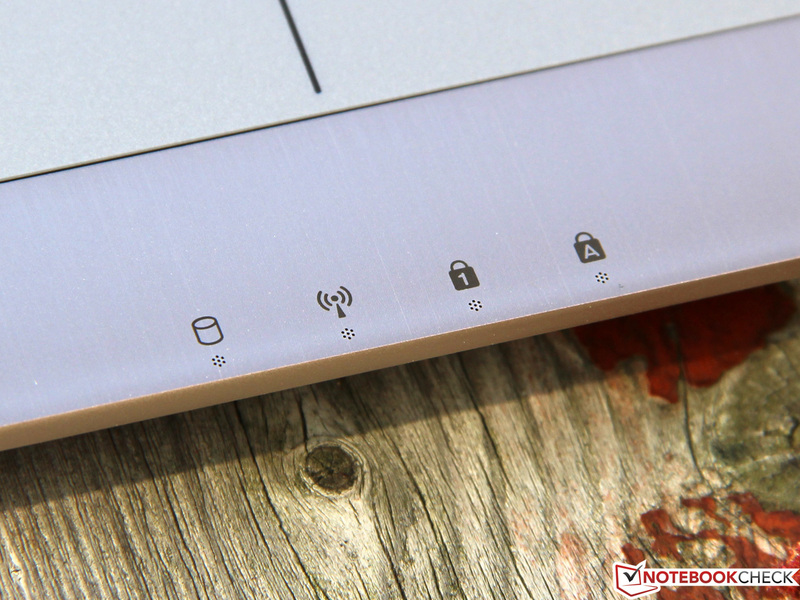 The MacBook offers a higher contrast ratio of 913:1 - and more vivid pictures and videos. 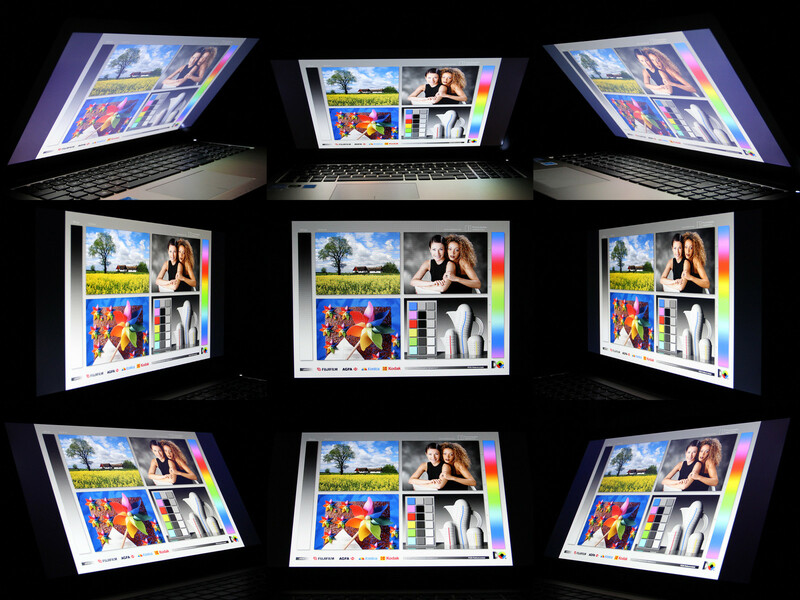 Those who frequently use professional programs like Photoshop rely on a display with highly accurate color reproduction. 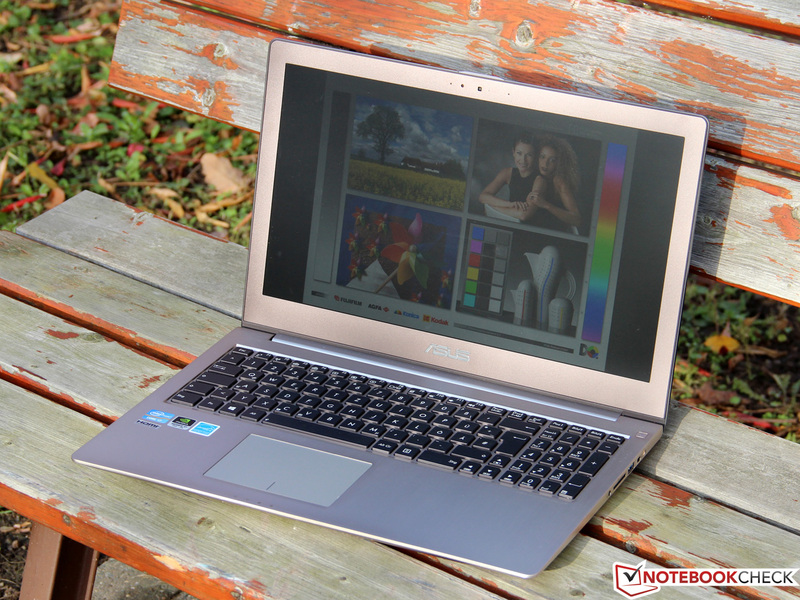 Here the Asus definitely can't keep up with the US competitor: the UX51VZ misses parts of the sRGB color space and AdobeRGB by a fair margin. Since the UX51 is a de facto Ultrabook, it won't just see duty at the desk at home, but will also be used as a mobile device on the road. 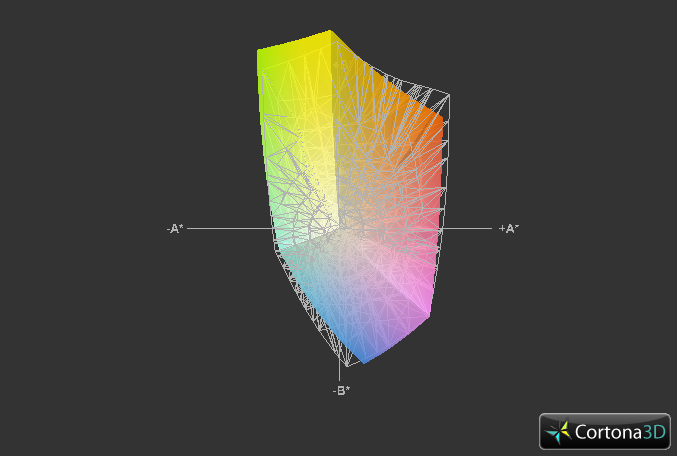 One of the most important requirements: a bright and non-glare display panel, which avoids annoying reflections. 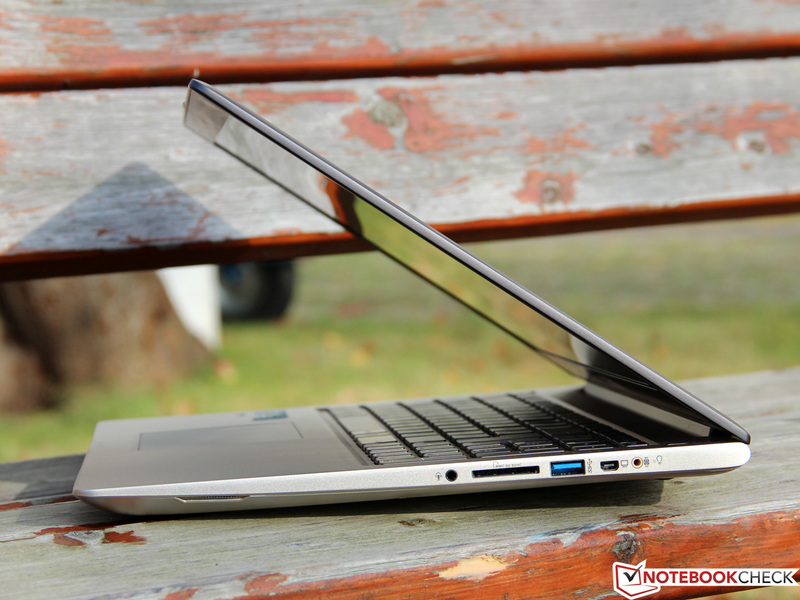 The notebook fulfills the requirements and can even be used when exposed to sunlight - unlike the competition from Apple and Dell, which feature glare-type screens. 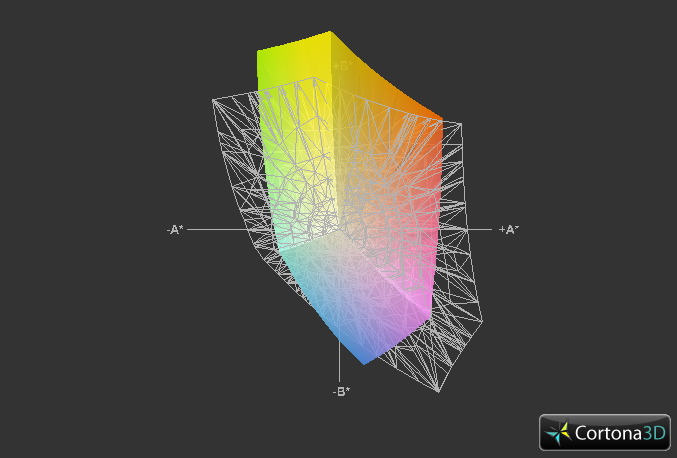 It doesn't matter if the display is viewed from the top, below, or the side: viewing angles of up to 180 degrees have no significant impact on colors and contrast. Even very good TN panels (like the one used in the Dell XPS 15) can't keep up with this performance and are prone to a decrease in picture quality much sooner. Adjustment of the screen every time the user changes his or her position slightly is definitely not necessary. Power-sipping ULV hardware? Mediocre on-board GPU? 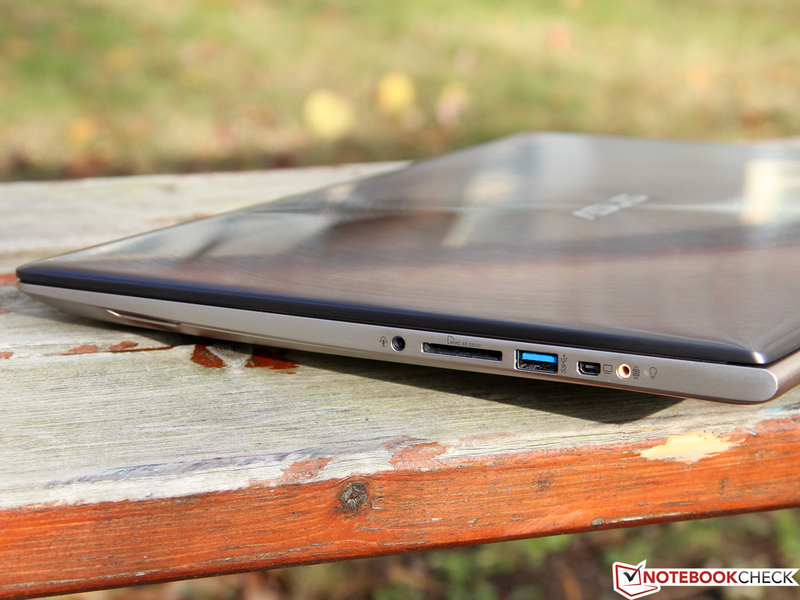 Not at all: the Zenbook UX51VZ features a tantalizing selection of high-end components. First in line is a speedy quad-core processor. To keep the power consumption under control, Asus uses a 35 watt model - Intel's Core i7-3612QM. 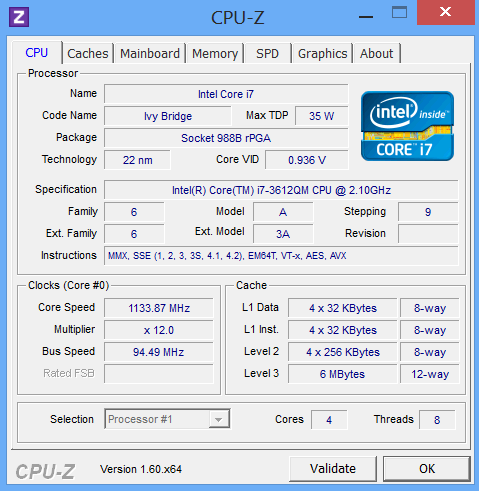 This CPU supports clock rates from 2.1 to 3.1 GHz (Turbo), which make it a bit slower than the 45 watt variants - but it still offers ample power for almost all usage scenarios. 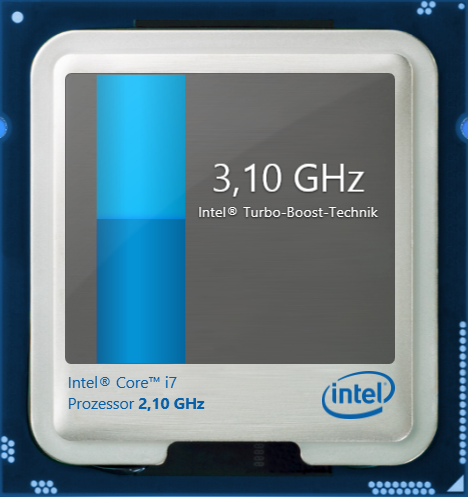 The Core i7 not only supports Turbo Boost, but also Hyper Threading, which means that each core can handle two threads in parallel. 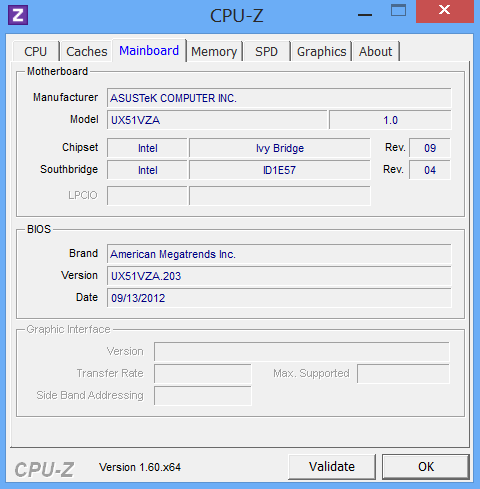 For further details, please take a look at our CPU Database and our article on Intel's Ivy Bridge Architecture. 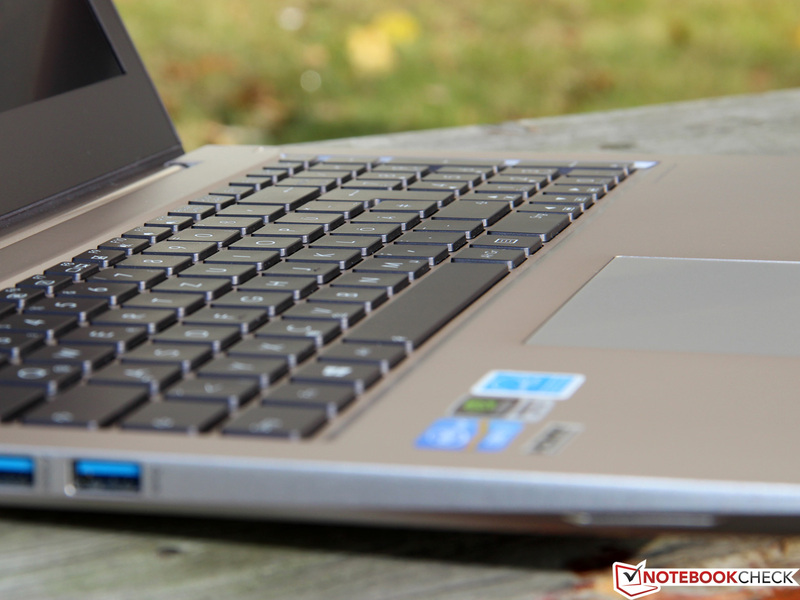 Intel's HD Graphics 4000 handles simple tasks like the acceleration of videos - for more demanding jobs (3D gaming), the notebook features a dedicated Nvidia GeForce GT 650M. Nvidia's Optimus technology switches between the two graphics options depending on requirements so power consumption and battery life are always optimized. Depending on the model, the UX51 either features a 256 or 512 GB SSD - one of the main reasons for the steep purchase price. 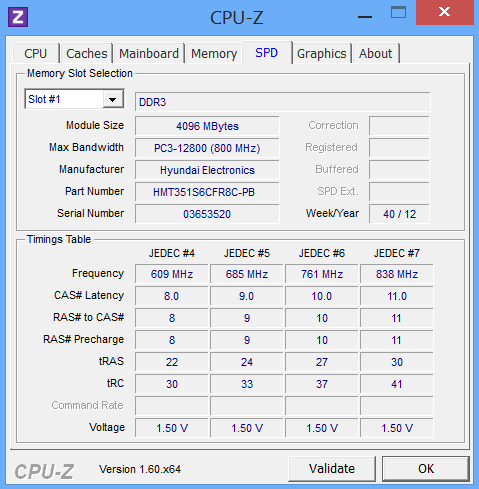 The 8 GB DDR3 RAM (from Hyundai) operates at 800 MHz DDR3-1600) and in dual channel mode. 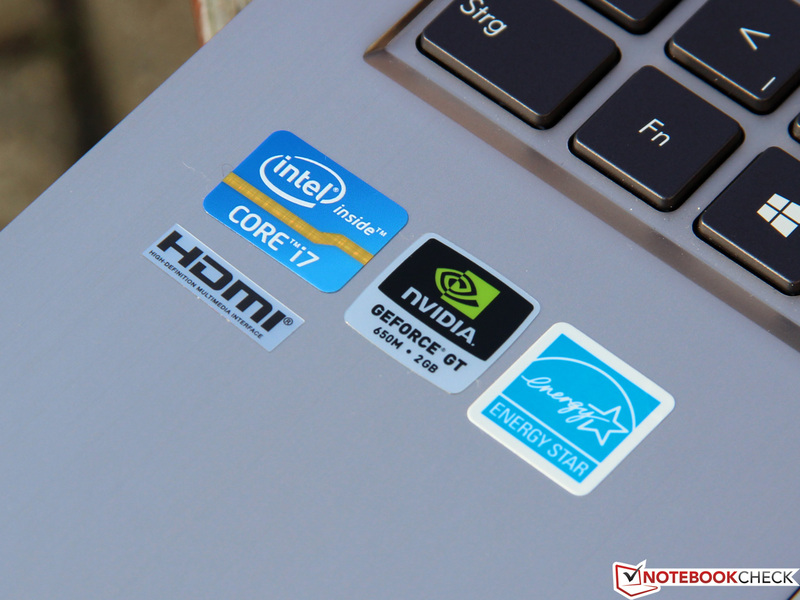 Even though the Core i7-3612QM is Intel's most power efficient quad-core processor, the heat it produces can still overburden the cooling systems of thin and small notebooks. Most manufacturers therefore throttle the Turbo frequency, which results in decreased performance. 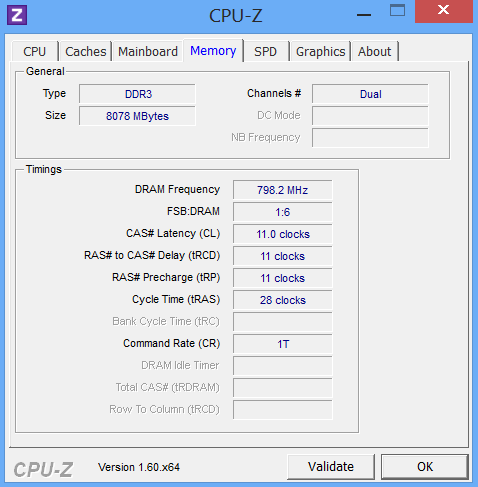 No reason to worry in this case: the Core i7 reaches the maximum frequencies of 2.8 GHz (multi threading) and 3.1 GHz (single threading) - and maintains them. The result of 5.64 points for the Cinebench R11.5 means that the 3612QM is almost twice as fast as the most powerful ULV model (Core i7-3667U). Even compared to other quad-core processors, the CPU fares really well. As we mentioned above: we didn't observe any loss of performance while the notebook was running on battery. So what can a manufacturer do if one SSD just isn't fast enough? Right - they can add a second one. For the UX51VZ, Asus uses two flash drives with 256 GB each, which results in a total capacity of 512 GB for the RAID 0 array. Due to the way capacity is calculated and because of the recovery partition, actual usable capacity is 440 GB (gibibyte, to be exact). 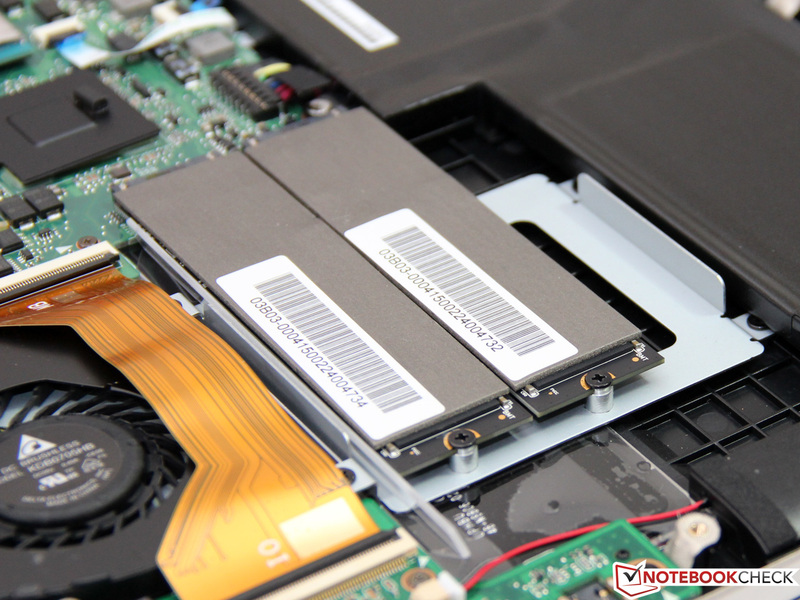 Our review model features two Adata XM11 SSDs, which we already encountered in the UX31A (which of course only has one drive). The controller from Sandforce (SF 2281) offers very good performance and is also used by many other manufacturers. Since the two drives operate in RAID 0 mode, the already very high transfer rates are essentially doubled. 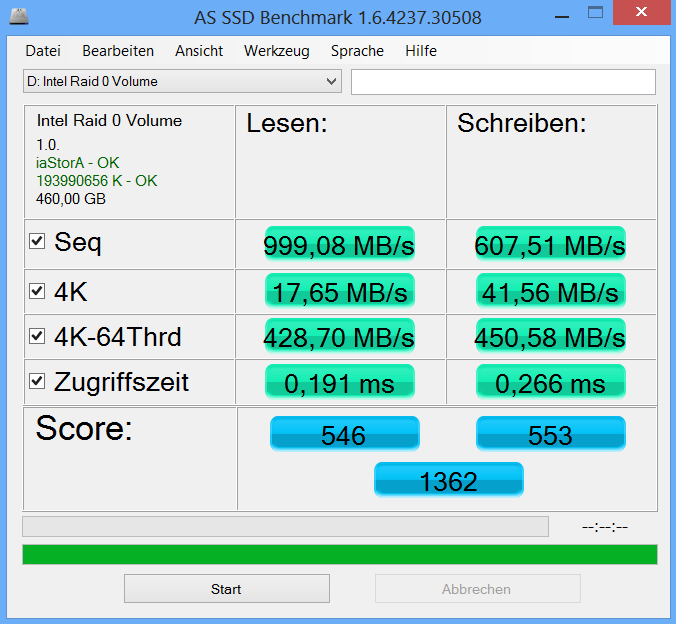 When we ran the AS-SSD Benchmark test, we recorded staggering sequential reads of 999 MB/s - a new record in our database. Naturally there are no advantages when small 4K blocks are read, since a RAID array scales only when larger files are used (depending on the stripe size). Please note: according to several user reports, Asus not only uses Adata SSDs, but also a drive from SanDisk. 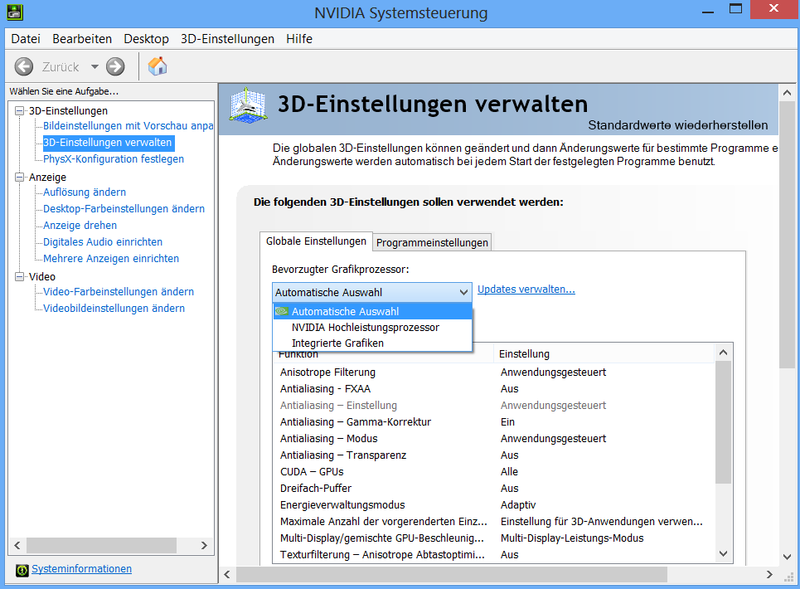 The model in question - most likely U100 - is quite a bit slower, especially when reading 4K blocks. With a quad-core CPU and fast SSDs, overall system performance is bound to please even power users. The UX51 scored 5454 points running PCMark 7 (pretty much the same as the similarly equipped MacBook Pro 15 Retina) and now occupies a top spot in our rankings. 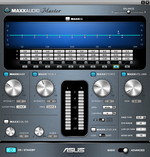 The UX31A is only about 5% slower - despite the ULV processor. This goes to show that the PCMark test is only moderately meaningful. 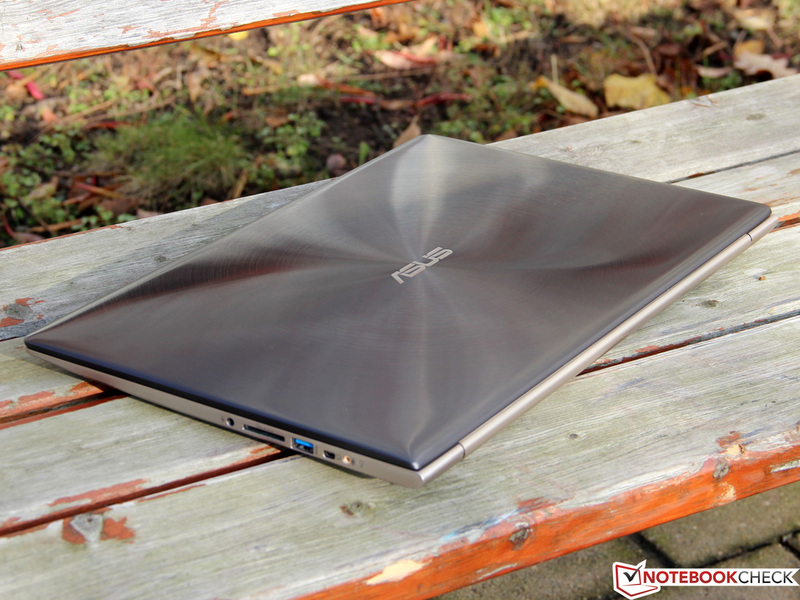 There are not going to be a lot of applications which are able to push the Zenbook to its limits. No matter if it is CPU intensive video editing or working with a lot of data - the notebook always seems to have the necessary processing power to get things done. Performance is good enough that the user could retire the desktop PC and rely entirely on the laptop. We were also impressed with the very short boot time of 13 seconds, although this might also be attributed to Windows 8. The GeForce GT 650M is an upper mid-level graphics card which is based on Nvidia's Kepler architecture and was introduced at the beginning of 2012. The chip is manufactured using a 28 nanometer process; the core consists of 384 GK107 shader processors and has access to 2 GB VRAM. 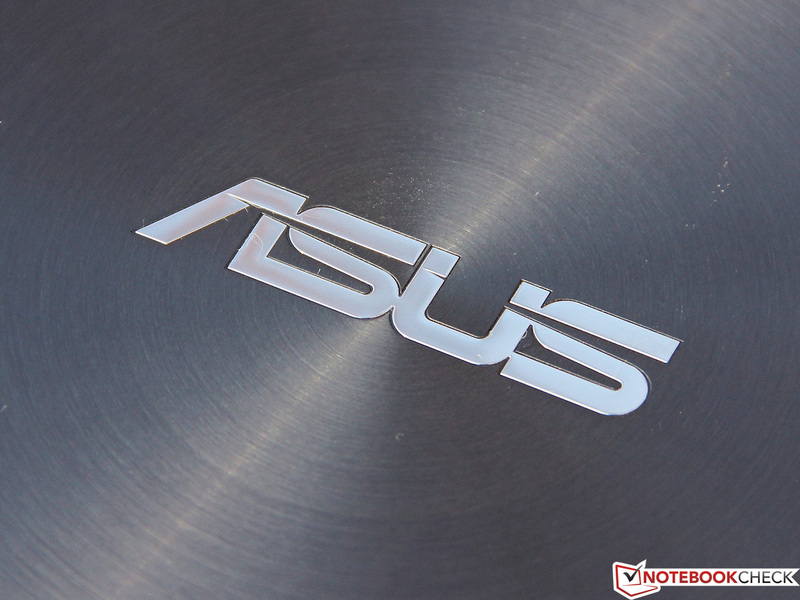 Asus incorporates the GDDR5 variant of the 650M, which features a wider memory bus width, but a slightly slower core speed. The card follows Nvidia's specifications and features a core speed between 735 - 850 MHz (Turbo) and a memory speed of 1000 MHz. 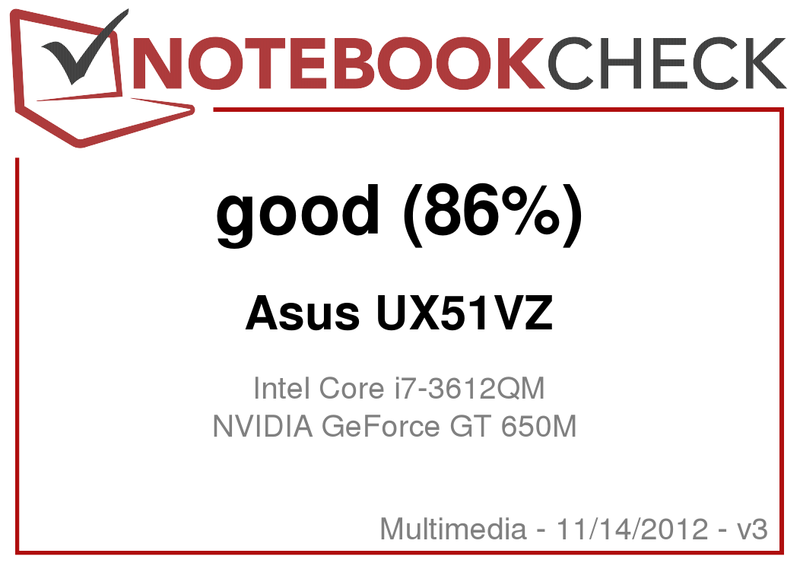 Not surprisingly, the UX51VZ scores similar to other notebooks with the same GPU. We used 3DMark 11 to assess the graphics performance. At about 2286 points, our review model is within striking distance of Apple's MacBook (2384 points). The Dell XPS 15, which uses the slightly slower GT 640M, is bested by about 17%. Ultrabooks without dedicated graphics usually score about 600 to 650 points and can't play in the same league. The GeForce GT 650M enables the user to play current games with a decent frame rate and quality. Depending on the title, FullHD resolution is sometimes too much for the Nvidia GPU - a resolution of 1600x900 or 1366x768 is then more appropriate. GPU intensive games that fall into this category are Battlefield 3, Anno 2070, and Dirt Showdown. 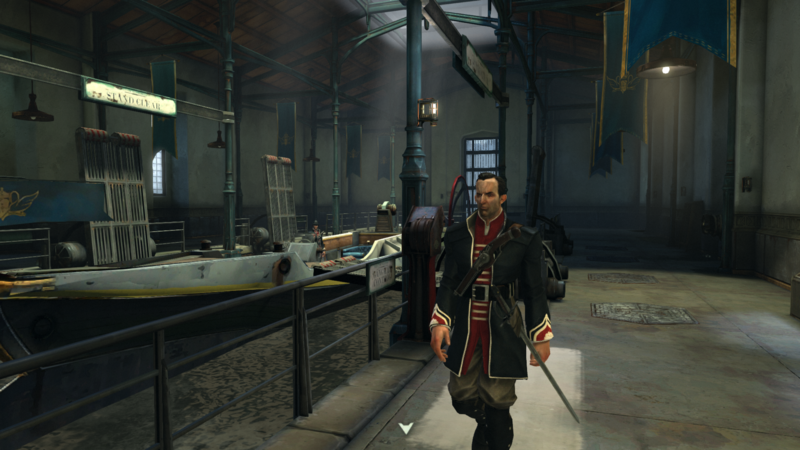 The other two games we tested (Diablo 3 and Dishonored) perform well even when the resolution is set to maximum, quality is high, and anti-aliasing is turned on. For a noticeable jump in performance a true high-end card would be needed - like the GeForce GTX 675MX, for example. 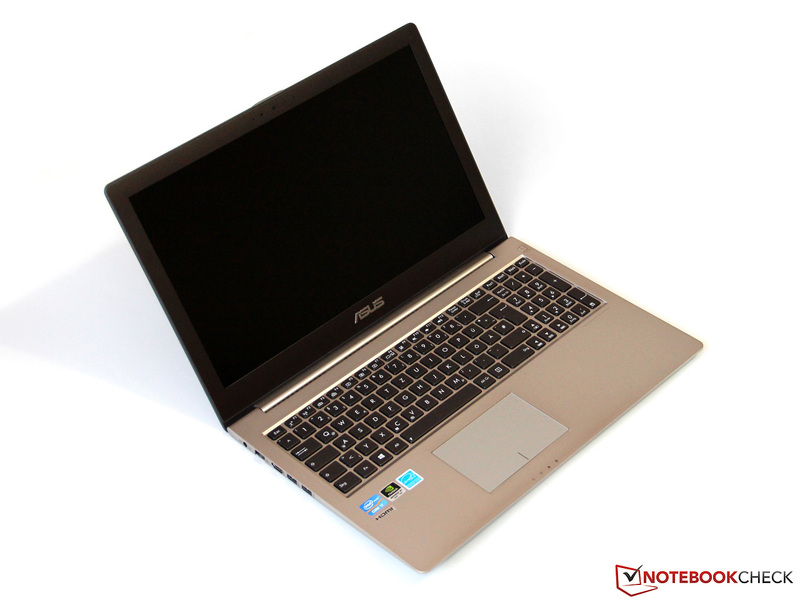 Usually this GPU (or a similar model) is only found in massive laptops designed to be desktop replacements and is hence not suitable for the slim Zenbook. 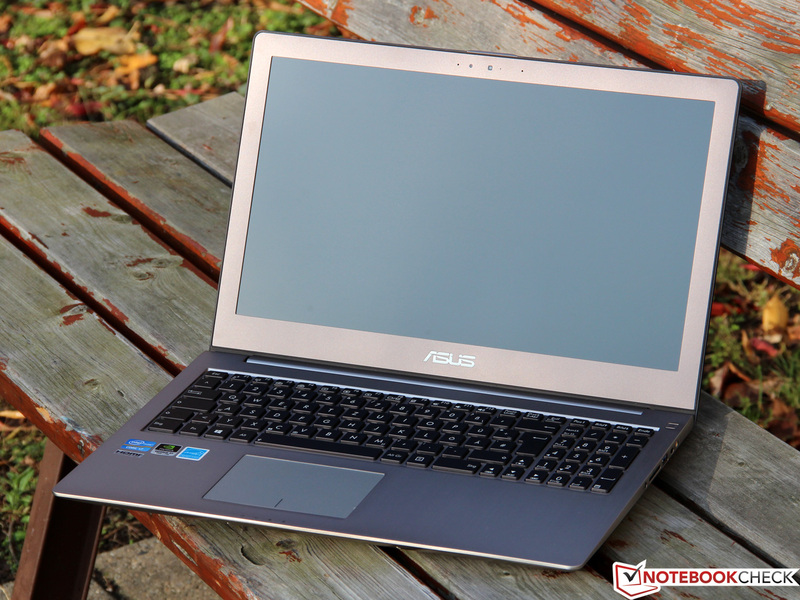 Just like the CPU, the graphics card offers full performance even when the notebook is running on battery (no throttling). It doesn't matter if the notebook is tasked with office-type duties, internet surfing, or just sits there idling: the two fans inside are always on. Unfortunately, we are not dealing with quiet examples of their breed: even during low load we measured a very noticeable (because of a high frequency whirring sound) 34 dB(A). 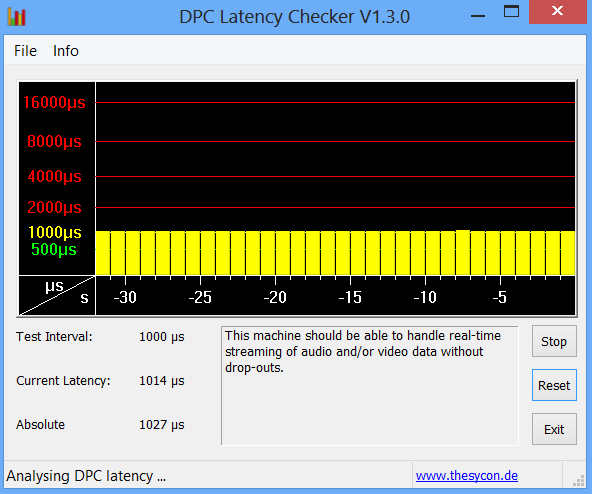 Many Ultrabooks and also the MacBook Pro 15 are almost completely silent - a huge advantage over the UX51VZ. When we used 3DMark 06 to simulate operation under load, the noise level increased to about 42 dB(A), which seems quite reasonable for a notebook of this size and performance. Overall noise level is acceptable - the user just needs to turn up the volume slightly when playing a game (or even better: use headphones instead). We could only observe the maximum level of 47.4 dB(A) when we ran our synthetic stress test. Since the fans are always active, the UX51 stays quite cool during a normal workload. The surface areas only get slightly warmer than ambient temperature, which makes using the notebook on the lap possible even for extended periods of time. Under maximum load we need to differentiate: on one hand, temperatures climb to almost alarming heights on the bottom near the fan exhaust (we measured up to 59 °C / 138.2 °F), on the other hand, the all-important palm rest stays comparatively cool and does not impact usability. 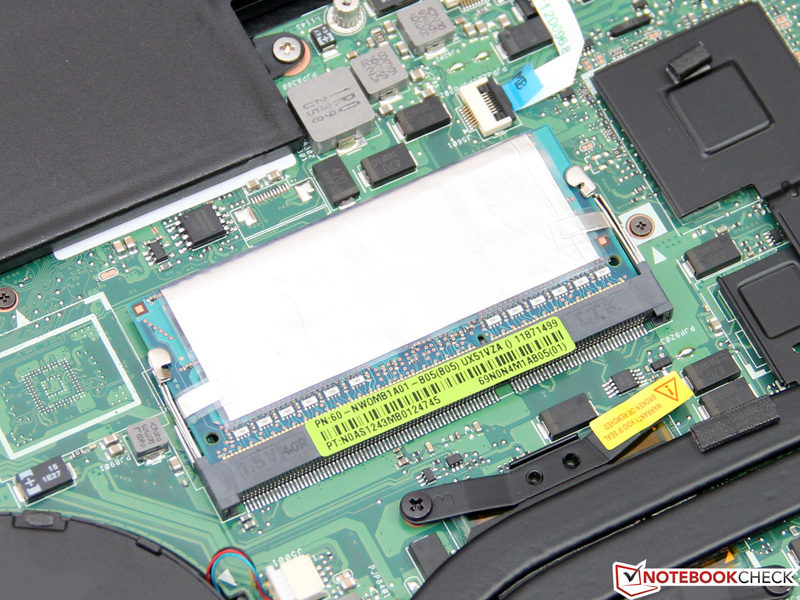 Just like the XPS 15 or the MacBook Pro 15 Retina, the UX51VZ is no stranger to CPU throttling. When we subjected the notebook to a stress test with Prime95 and FurMark, the four processor cores throttled back to 1.2 GHz, but immediately recovered and resumed their work at the core frequency of 2.1 GHz. 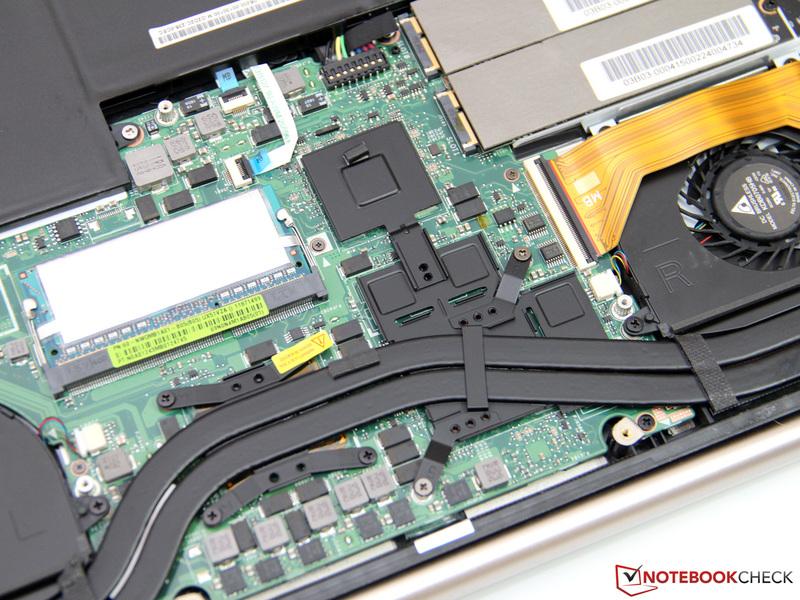 The reason: as soon as the core temperature reaches 80 °C (176 °F), the notebook starts lowering the frequency to protect the CPU. 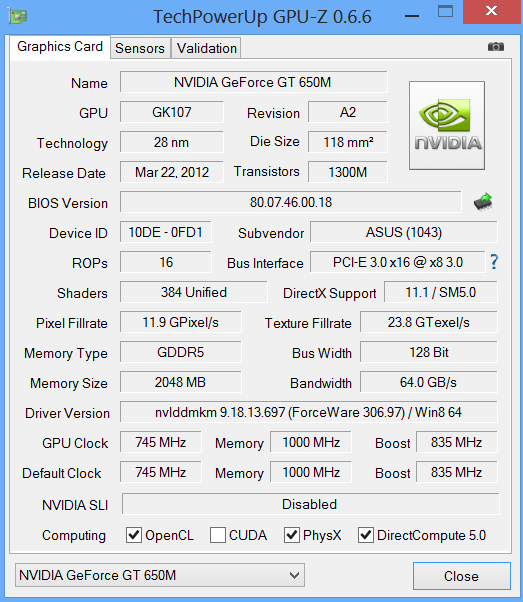 The graphics card is not affected and maintains its maximum frequency at a temperature of 70 °C (158 °F). 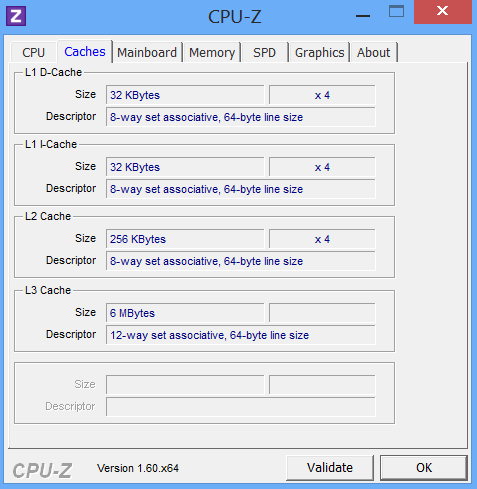 While performing typical tasks (running programs or playing games), throttling is never really an issue. Overall, we consider the cooling system to be adequate, albeit operating fairly closely to its limit. (-) The average temperature of the palmrest area of similar devices was 29.1 °C / 84.4 F (-4.3 °C / -7.7 F). 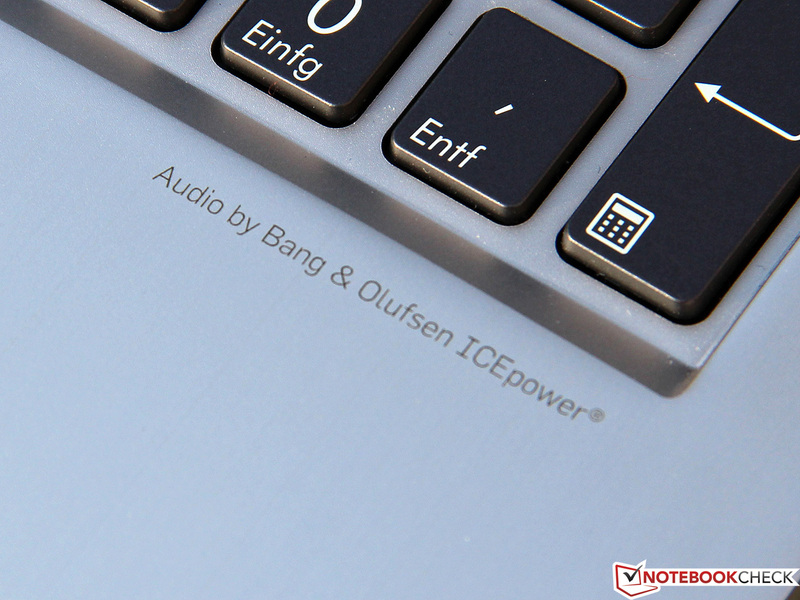 Asus equips the notebook with a sound system from the well-known Hi-Fi specialist Bang & Olufsen. The highlight is the additional external subwoofer, which is supposed to supplement the fairly weak bass output so common to notebooks. The small cylinder (about 9 centimeters / 3.54 inches high) gets connected using a special 2.5 millimeter connector and is able to improve the sound quality significantly. Music, movies, and games can be enjoyed without the need for external speakers - and at levels high enough to almost upset the neighborhood. 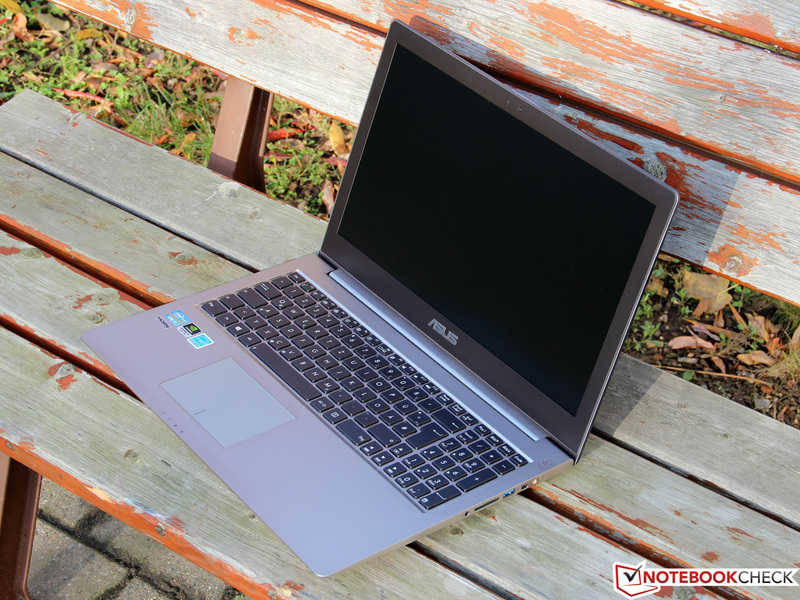 The UX51VZ is not able to approach the low power consumption of some Ultrabooks, since the quad-core processor and the SSD-array take their toll even during idle. Power consumption is between 9.5 and 12.7 watts - similar to the competitors from Dell and Apple. 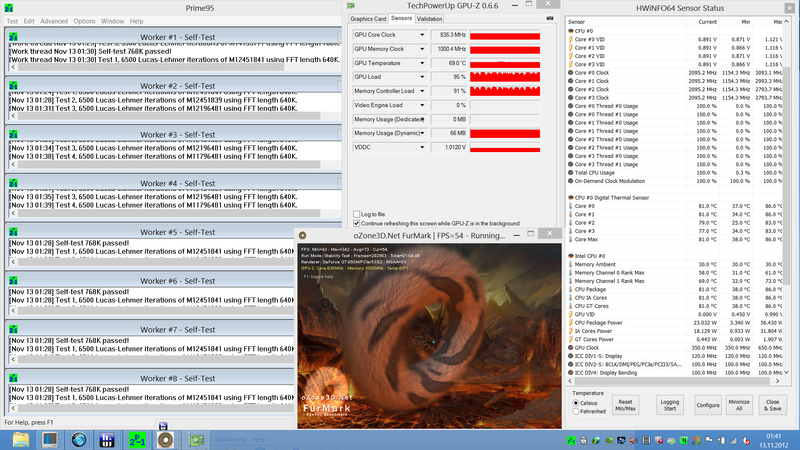 Under load, the UX51VZ gets significantly more power hungry: we measured 74.1 watts during the 3DMark 06 benchmark test and 90.8 watts during the stress test. This is significantly more than the MacBook Pro 15 (68 to 77 watts) and XPS 15 (49 to 80 watts). 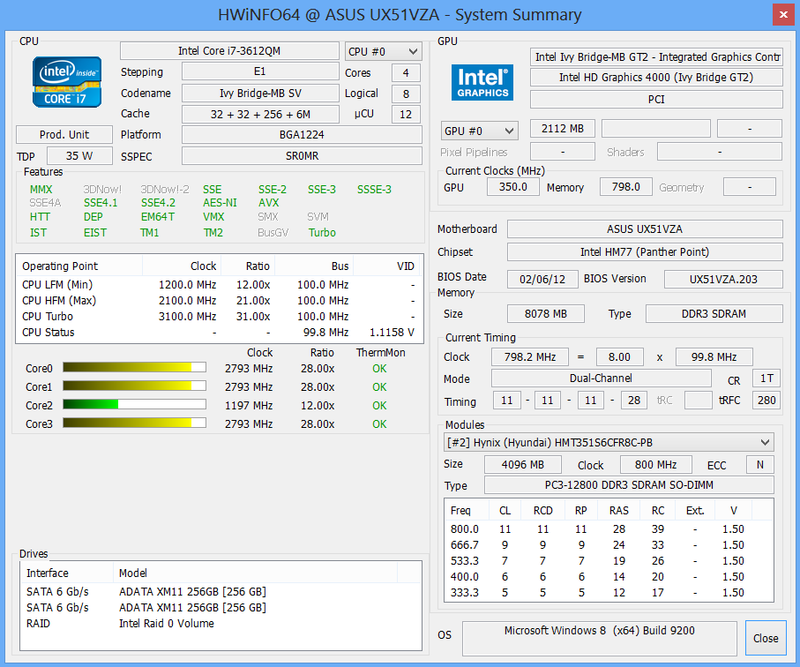 One thing should be considered here though: compared to the other notebooks, the UX51VZ is least prone to throttling. The power adapter delivers only 90 watts and seems to be a tad undersized, as it operates close to its limit - we measured temperatures of up to 63 °C (145.4 °F). The lithium polymer battery is integrated in the chassis and features a capacity of 70 Wh. Combined with the acceptable power consumption, the notebook posts decent run times on battery. 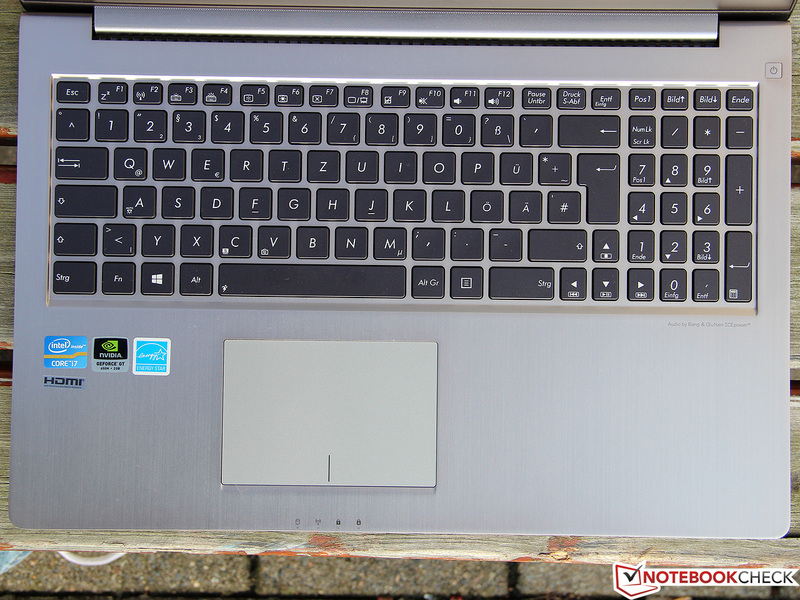 During the Battery Eater Readers Test (all wireless modules off, display brightness turned down all the way, power saver profile), the notebook lasted right around 8 hours. Compared to the MacBook (95 Wh battery, optimized OS X operating system, and extremely low minimum display brightness), which achieved 18 hours, this seems to be quite low - but this test is not really that relevant during daily use. The more realistic WLAN surf-test (brightness set to 150 cd/m², power saver profile) required us to plug the Zenbook back in after 5 hours and 17 minutes. The two notebooks are almost even in this test - Apple's MacBook lasted about 6 hours. Finally, we ran the Battery Eaters Classic Test (all wireless modules on, display at maximum brightness, performance profile). This time, the notebook lasted 1 hour and 15 minutes before a recharge was required (a complete charge takes about 3 hours). 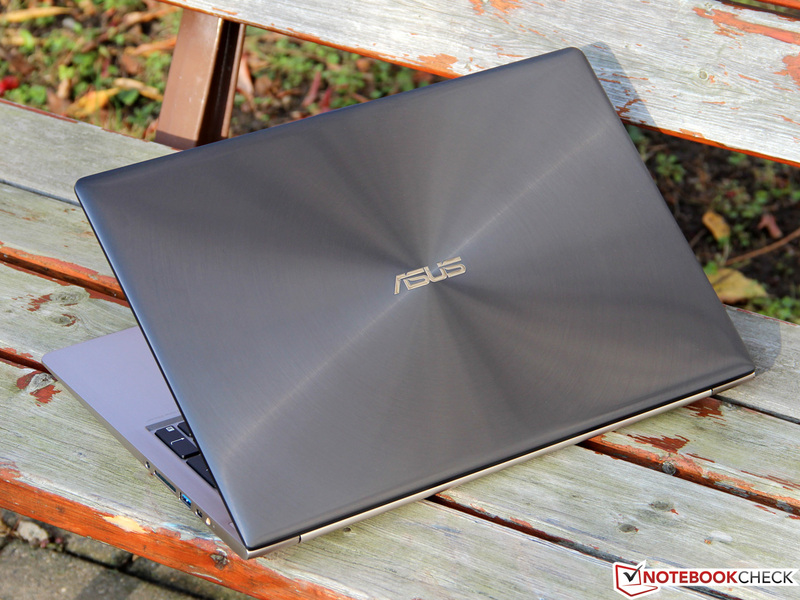 We spent almost one week with the Asus Zenbook UX51VZ to answer this one question: has the MacBook Pro 15 Retina finally found a worthy competitor? At this point of our review, we'd like to summarize our findings. Even though the Zenbook doesn't quite achieve the superior build quality of the MacBook, the aluminum chassis still managed to impress us. Fit, finish, and material selection are top notch; the notebook is also a lot more rigid than one would expect given the slim housing. We also appreciate the precise input devices and the very good mobility. We had high expectations regarding the display. 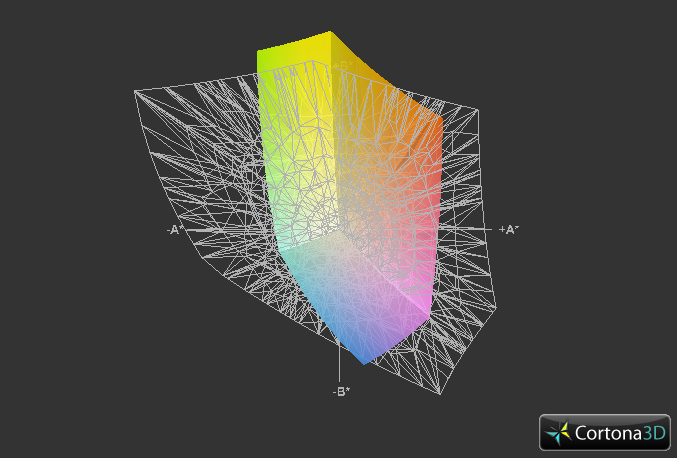 Unfortunately neither the contrast ratio nor the maximum brightness are quite as good as we had hoped. We won't dispute that the IPS panel is a high quality example - it just can't quite compete with the outstanding Retina display or even the panel used in the smaller UX31A. As far as overall performance is concerned, the UX51VZ has nothing to hide: processor, graphics card, and the SSD RAID array allow for the speedy execution of tasks with plenty of power to spare. Even demanding software won't push the notebook to its limit. Compared to some competitors, the cooling system is able to handle its task and throttling is not really an issue. 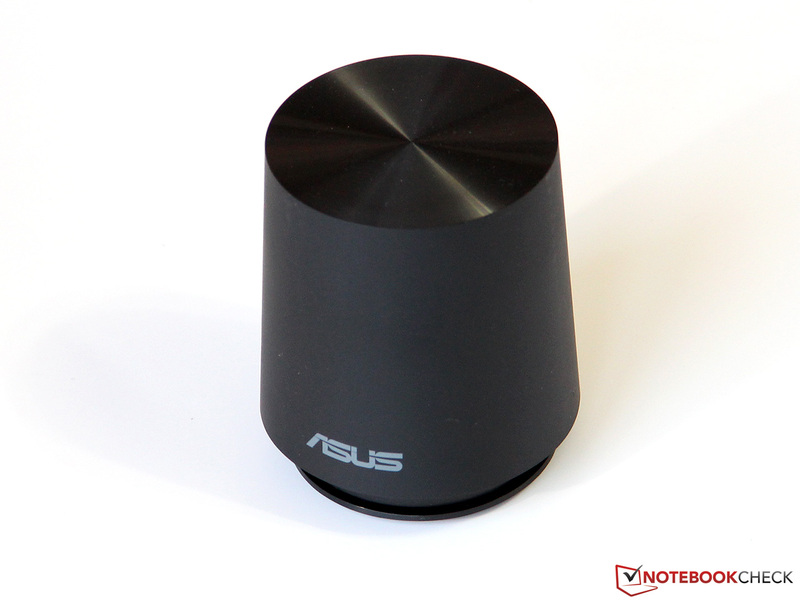 We hope that Asus will rework the fan control in a future version to reduce system noise during idle. While the Zenbook manages to get many things right, we still think that the MacBook has a slight edge in quite a few disciplines. If the (similarly equipped) Apple notebook is worth the premium, is in the eye of the beholder. 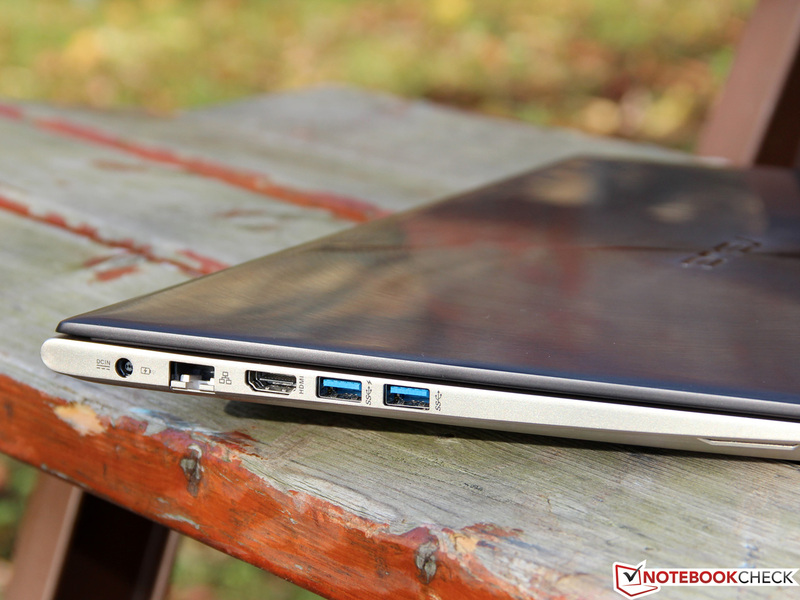 Overall, we think the UX51VZ has earned its rating - we can definitely recommend this notebook. 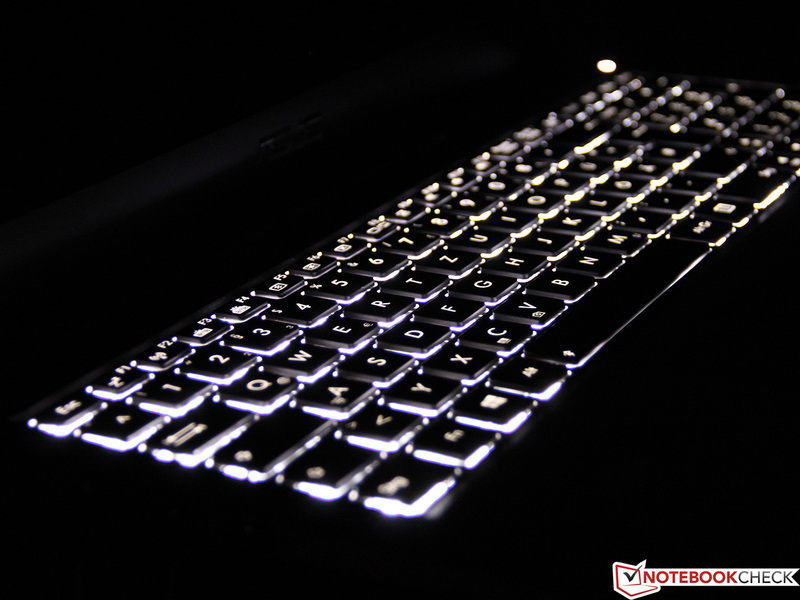 The keyboard features LED backlighting. Hardware galore: we doubt users will complain about a lack of power. It's pretty rare to have so many items included in the box. which supplies the bass frequencies and helps out the integrated speakers. The audio components are sourced from Bang & Olufsen. The underside features a large bottom cover. via heatpipes from the CPU and GPU. and the module is protected with an anti static cover. Upgrading the proprietary drives is not possible. The Mini-PCIe WLAN adapter is from Intel. Touch typists will like the excellent feedback. challenge the well-established MacBook Pro. down to the little details. Size and weight are in Ultrabook territory. just like the status LEDs. as well as Mini-VGA - but unfortunately no DisplayPort. The power adapter looks a little like it could be from Apple. 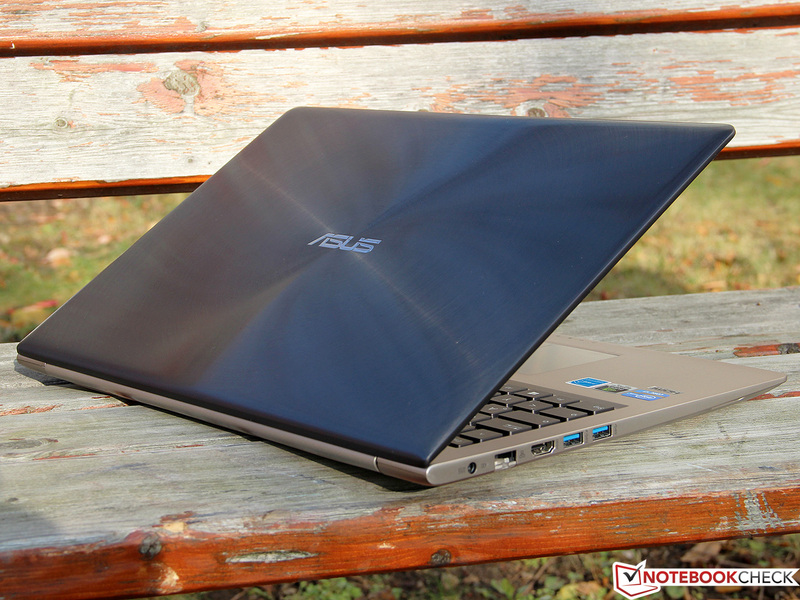 Even though it is as slim and light as a comparable Ultrabook, the Zenbook has the performance of a multimedia power house. The quality is also top notch - the well-executed aluminum chassis and the superb input devices justify the pretty substantial price. We don't find a lot of things to complain about - except for maybe two points: the cooling system is just too noisy during idle. Asus should be able to improve fan noise since the temperatures don't climb much unless the system is under quite a bit of load. Very high resolution displays would also benefit from a DisplayPort. Even though the notebook is still subject to throttling under extreme load conditions, overall it is pretty impressive how the cooling system deals with the heat from the CPU and GPU (the Dell XPS 15 has issues here - even though it is much thicker). The main competitor is without a question the even higher-quality (if by a slim margin), but much more expensive Apple MacBook Pro 15 Retina. 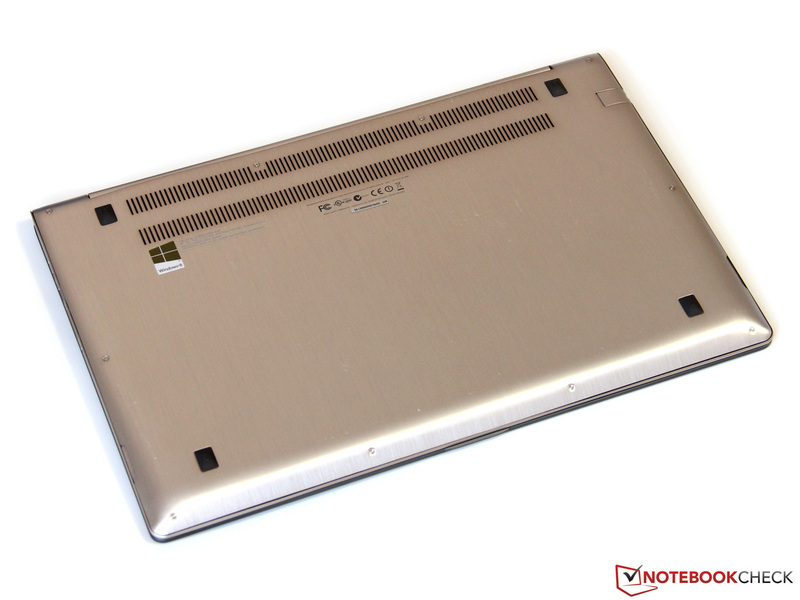 Depending on the usage scenario, other notebooks might also be candidates: the Dell XPS 15, Sony Vaio SV-S1511, or the extremely thin Samsung 900X4C (ULV CPU) come to mind.